alaTest has collected and analyzed 49 reviews of Sony DCR-SX21. The average rating for this product is 4.1/5, compared to an average rating of 4.0/5 for other Camcorders for all reviews. Reviewers are impressed by the battery and zoom. The price and portability are also mentioned favorably. There are some mixed opinions about the image quality. We analyzed user and expert ratings, product age and more factors. 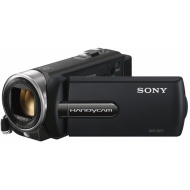 Compared to other Camcorders the Sony DCR-SX21 is awarded an overall alaScore™ of 79/100 = Good quality. alaTest has collected and analyzed 3 user reviews of Sony DCR-SX21 from Amazon.co.uk. The average user rating for this product is 3.7/5, compared to an average user rating of 4.0/5 for other Camcorders on Amazon.co.uk. Opinions about the usability and price are on the whole positive, whereas some have doubts about the image quality. good value and very easy to use.Battery lasted all day and evening taking random video at a wedding. Great little camera that has a brilliant high powered optical zoom I am really pleased with the recordings I have taken they are really clear and crisp even at long distance a full battery charge last a good while too.